It’s too bad that Steven Spielberg’s latest film War Horse doesn’t quite live up to the example set by its majestic titular character. You know, there’s a reason so many movies get made about horses: they’re beautiful, powerful creatures that have the ability to make a dramatic cinematic statement with the pounding of their hooves and a mighty toss of their mane. It’s too bad that Steven Spielberg’s latest film War Horse doesn’t quite live up to the example set by its majestic titular character. If you’ve seen the trailers, you’ll already know exactly to expect. It’s a technical beauty (thanks to famed cinematographer Janusz Kaminsky) and a heart-wrenching emotional manipulator (credit goes to Love Actually scribe Richard Curtis and Billy Elliot writer Lee Hall, not to mention John Williams for his requisite sweeping score) that contains a frank depiction of the futility of war, while still managing to stay 100 percent family friendly. Based on the young adult novel by Michael Morpurgo and the award-winning stage play written by Nick Stafford, the story follows young Albert and his faithful horse Joey who ends up touching the lives of both officers and civilians alike as he’s taken out of Ireland to serve as a mount in World War I.
Albert’s father (Peter Mullen) is a down-on-his-luck farmer who’s goaded into buying the handsome and wild Joey at auction, instead of the plough horse he’s meant to purchase. Bringing him home to his beleaguered wife (Emily Watson) causes a fight after it’s revealed he’s spent the rent money on an animal that won’t help them farm the crops they need to sell in order to make more money. 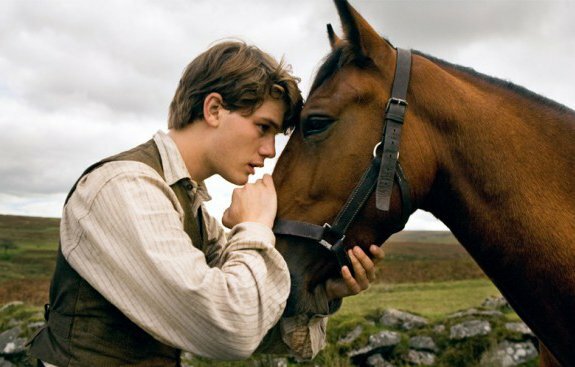 Albert (Jeremy Irvine) vows to teach Joey to plough which leads to a bond between horse and boy that’s unshakable. After a spat of bad weather ruins the crops, Albert’s Father is forced to sell Joey to an English officer when war is declared and Joey is shuttled into the trenches. As the war heats up, the story follows Joey from battlefield to battlefield as he witnesses the pain and cruelty inflicted on everyone touched by the fighting. Along the way he’s captured by the Germans; hidden by a little French girl (Céline Buckens) and her Grandfather (played by French character actor Niels Arestrup); recaptured again and so on as he makes his way across battle zones. Albert, too young to follow Joey at the beginning of the war, eventually joins the land army and sets out to find his horse amongst the human carnage. Spielberg’s attempt to create a story of human/animal bonding overlaid with an anti-war message is a noble one at which he almost succeeds. It’s adequate enough on both counts, but it falls just short of achieving the heart evident in movies that celebrate the love of a child for his pet (Old Yeller, The Yearling) or the eerie realism of films that portray the impact of the horrors of war on the people actually doing the fighting (All Quiet on the Western Front, Joyeaux Noel). Rather, War Horse is painfully earnest and clearly more concerned with its aesthetics over its exploration of genuine emotion. Joey’s plight and the dangers he faces are certainly moving (who doesn’t get a little teary when faced with an animal in peril?) but the lack of depth, passion or originality in the story makes it hard to really connect. The film is obviously meant as throwback to good old-fashioned harrowing storytelling, full of easily identifiable character types and spirit-raising themes. The impossibly colourful vistas look like hand-painted backdrops on a retro soundstage, and the dialogue is so frequently on-the-nose and repetitive, you could almost make a drinking game out of how many times Joey is described as “a remarkable horse” or a character describes exactly what’s going on in the scene just to make sure the smaller (or slower) audience members are up to speed. 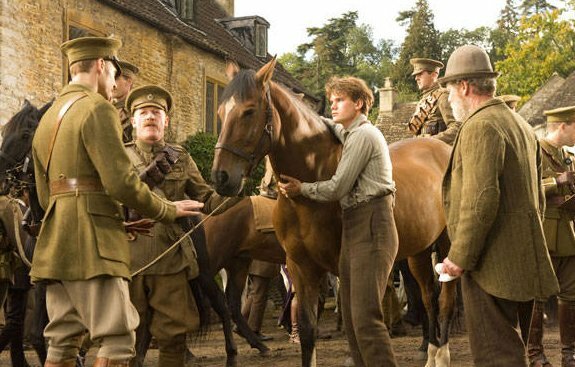 In the end, as engaging as War Horse occasionally is, Spielberg mostly resorts to giant Williams-enhanced, wide-screen moments to manipulate the sentiment that the story – remarkable horse or not – should have been able to elicit on its own.